Tiger Tales: A Detroit Tigers Blog: Who is Clete Thomas? You may have heard by now that Clete Thomas has a chance to make the Tigers 25 man roster at the start of the regular season. You mean "Thames"? No, I mean Thomas. There is really a guy named Cleat? No, it's Clete. If you don't follow the minors closely, you may not know too much about him so I thought I'd give you a brief overview. 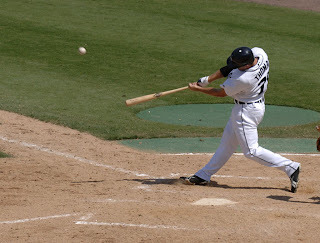 Thomas is a 24 year old outfielder who was drafted out of Auburn by the Tigers in the sixth round in 2005. He is 5-11 195, bats left-handed and throws right-handed. Since the summer of 2005, he has moved through the Tigers system making all the stops between short season Oneonta and AA Erie. He split the 2005 season between Oneonta and West Michigan batting .311 with a .393 OBP in 264 at bats. He then struggled at high A Lakeland in 2006 hitting .255 with 127 strikeouts in 132 games. He rebounded nicely last year at AA Erie batting .280/.359/.404 with a 110/59 K/BB ratio. According to the Baseball America Prospect Handbook, The althletic Thomas uses the whole field but struggles with breaking pitches resulting in the high strikeout rate. He doesn't have much home run power but has pretty good gap power (30 doubles and 6 triples in 2007). He struggles against left-handed pitchers - a .718 OPS versus southpaws and .795 against right-handers. He is very fast but still needs to refine his running game. Defensively, Thomas can play all three outfield positions, has good range and an above average throwing arm. According to a study by Dan Fox published in the Baseball Prospectus Annual, Clete had one of the best outfield arms in the minors last year finishing second in Equivalent Throwing Runs (theoretical runs saved by his arm). Chances are Jim Leyland and Dave Dombrowski will take Freddy Guzman over Thomas but they are intrigued by Thomas. If Clete does make the team, he will likely back up Brandon Inge while Granderson heals. Since Inge is also going to be the second catcher, they will need another center fielder when he spells Rodriguez. The name is Clete Thomas. If nothing else, he's got a great baseball name. Now that we've placed Guzman on waivers who else could play that spot other than Thomas? Jones could play it but they probably don't want to move him around. I think Thomas has made the team.